EARLIER this season, John Michael Obi, or John Obi Mikel as he is now known worldwide, played his 250th match for Chelsea. That’s quite an achievement considering the Nigerian – who speaks with more-than-a-hint of a British accent – is only 25 years old. 6 seasons in to his Chelsea career, his contribution is still being belittled by part of Chelsea’s fanbase, as well as by supporters of other teams. Is this fair? It’s been a somewhat busy few months for Mikel. He is rumoured to be on the verge of a new five-year contract, scored a very rare goal for in a crucial qualifier for Nigerian recently, and has recently become embroiled in a racism scandal. I am not going to get in to off-field matters too much though, and I am not going to rehash how Mikel came to be a Chelsea player, or how he got his nickname. It is, however, worth pointing out that Chelsea made a high court claim against Mikel’s former club, Lyn Oslo for the £16m transfer fee. This was settled out of court. This is about what he does on the pitch. I will leave all the boring narrative and back-story out. Fact is, José Mourinho brought him to the club at the age of 19 (describing him as “pure gold”) and soon looked to convert him in to a defensive midfielder. 250+ games later, people are still debating whether defensive midfield is his rightful position, and others are even debating whether he’s good enough for Chelsea. 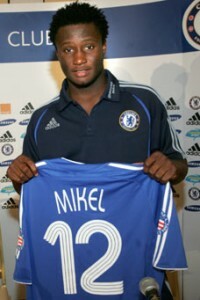 In Mikel’s first season at the club, he started 24 games and made a further 18 substitute appearances. Even though Chelsea played a mammoth 64 games that season, 42 appearances is still a huge show of faith in a 19 year old. A fair bit of this had to do with Essien having to start 17 games in defence that season (15 at centre back, 2 at right back). Going back over my records, I’m surprised to learn that only 10 of those 24 starts were as the defensive midfielder. His other 14 starts came in a variety of roles, from the shuffling role on the side of a midfield diamond (the most common shape that season) to playing both on the left and the right of a midfield triangle. 12 of those 14 other starts were with Makélelé as the holding player, with a further 2 starts seeing Lassana Diarra used in the holding role (though there were also games where Diarra played further forward and Mikel played as the DM). It was clear that Mourinho was gradually moving towards using Mikel as Makélelé’s successor. He was fined several times in his early weeks at the club for being late, and was sent off on his full league debut at Reading. You may remember Drogba giving him a good telling-off as he left the pitch. He then received a second red card as a Chelsea player in the Carling Cup final against Arsenal for grappling with Kolo Touré. This was a harsh red card as the resulting fracas between the two teams had been largely caused by Cesc Fabregas trying to get Frank Lampard in a headlock. After his impressive performance away to Porto (after replacing Robben, himself a substitute, at half time), Mourinho hauled Makélelé off at half-time in the return leg, as Chelsea trailed. Mikel brought a more adventurous passing range and helped turn the tie around, something both managers acknowledged after the game. Chelsea won 2-1 after being 1-0 behind at the break. Mikel’s big game aptitude was seen again with a very good display in an FA Cup replay win at White Hart Lane. 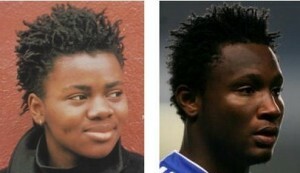 Mikel bears a striking resemblance to musician Tracy Chapman (left). He did an expert job closing off angles in to Berbatov’s feet, as well as stopping the Bulgarian from bringing down long punts from Paul Robinson. This had been one of Tottenham’s regular ploys that season. Mourinho rewarded him with a start in the Champions League Quarter Final First Leg against Valencia. Makélelé was left amongst the substitutes. Although he had a tough evening against David Silva, who scored one of the best goals seen at Stamford Bridge in many a year, Mikel had acquitted himself well. However, with the tie at 1-1 and a trip to The Mestalla ahead, Makélelé would surely return for the away leg. He didn’t. Mikel started at the base of a midfield diamond and was absolutely superb as Chelsea won 2-1 after going behind. Makélelé entered the action as a 90’th minute substitute for Frank Lampard. Mikel later started both semi-finals against Liverpool on the right of a 3 man central midfield. Essien was suspended for the first leg, and was required in central defence for the second leg after Ricardo Carvalho got injured at Newcastle. Mikel got 2 goals in that first season, both in the FA Cup. Remarkably, he has not scored since. The season ended with him starting to Makélelé’s right in the FA Cup final. He played all 120 minutes and gave a very steady performance for one so young. This season was interesting because Mourinho also used Diarra at right back for large parts, and Shaun Wright-Phillips as central midfielder. It appeared to be a season for converting players in to different roles. Mikel was red carded for this challenge on Patrice Evra in Avram Grant’s first game in charge. In Mikel’s second season, he played 28 games with a further 11 substitute appearances. Avram Grant used him almost exclusively as a defensive midfielder. This is not surprising as Makélelé was starting to require more regular rests, Essien was freed to play a full season in midfield after Alex and Ben-Haim had come in to bolster central defence, and Steve Sidwell had joined the club as another midfield option. This was a more specialised season of development as he wasn’t shifted in to several different roles and only got to start 3 games in the same XI as Makélelé. He made 24 starts as a defensive midfielder and 4 on the right of the midfield trio. One of those starts was under Mourinho, before his departure. Mikel started in Avram Grant’s first game in charge at Old Trafford, but was sent off for a late challenge on Patrice Evra. This 3-game ban robbed him of a chance to impress the new manager. Mikel’s final start of the season in a slightly more advanced role came in a disappointing 1-0 defeat at The Emirates. With a weak forward line being fielded due to injuries, Mikel was head and shoulders above his teammates in attempting to drag the side back in to the game, including coming close to scoring. Mikel was sent off for a 2nd time that season for a poor challenge on Phil Neville in the League Cup semi-final, but Chelsea still made the final, and he for the nod for the game in Cardiff. Chelsea went down somewhat surprisingly to Tottenham. Not a single Chelsea player aside from the two centre backs played well in that final as Avram Grant had picked a hopelessly unbalanced team. That Everton red meant a 4-game ban and because Mikel also spent a few weeks at the African Cup of Nations, his minutes for this season weren’t particularly high. Mikel was an unused substitute in the Champions League Final. Claude Makélelé departed the club at the end of that season, as did Avram Grant. With Mikel now almost 21, this was a crucial time for him, and his constant red cards were a worry. Would the new manager show faith in him as Makélelé’s replacement, or would a new defensive midfielder be signed? In Part Two, we looked at the form of John Obi Mikel form under new manager Luiz Felipe Scolari and later interim manager Guus Hiddink. Great article. I’d forgotten about Mikel’s introduction into the team. The Valencia game was were he received a lot of praise for a mature performance. The lad was only 19.